I used a pair of 24″ #1 Addi turbo needles. The yarn is Brown Sheep Wildfoote Handpainted in the Brown Sugar colorway. 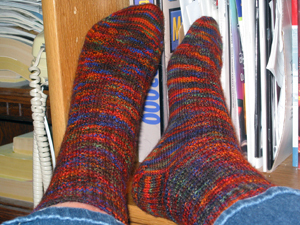 The socks were knitted toe-up using Queen Kahuna’s “no-wrap, no gap” heelsfrom the Crazy Toes And Heels book. I used an “invisible” figure-8 cast on and a super-stretchy grafted cast-off (the dreaded kitchener!). The instep and ankle are worked in “blueberry waffle” stitch (2 rows 2×2 rib, 2 rows stockinette, repeat). I think I’ll call them Waffles With Brown Sugar. The socks fit great! Super comfortable, stay up, etc. Hopefully I’ll get to wear them a couple of times before it gets too warm for wool socks. As always, click on the pic to see the larger version. You will also be treated to a close-up of a tiny slice of my messy home office.